Last Friday China's commercial airline manufacturer COMAC conducted the first flight of the C919, the country's first homegrown attempt to enter the high end of aircraft manufacturing dominated by Boeing and Airbus. 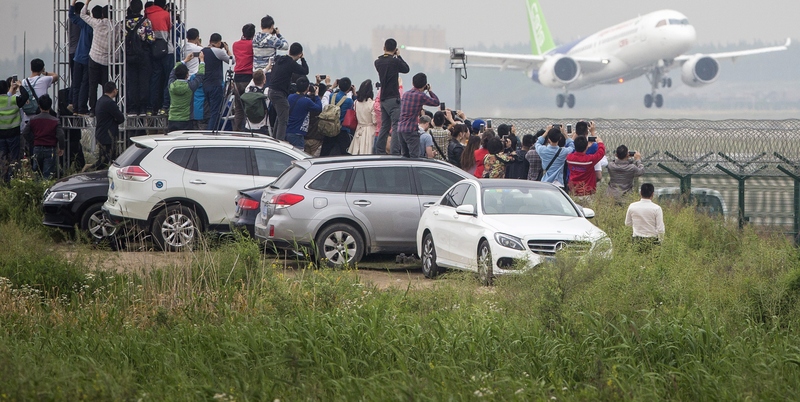 Much of the reporting on this event seemed contradictory: the event was billed as a historic day for Chinese aviation, but the media also pointed out COMAC is years behind industry leaders Boeing and Airbus, and that the C919 is not a serious competitor to their 737 and A320. Both things are true. The aviation industry magazine Leeham has a neat summary of the C919's prospects, pointing out that whatever advantages it might have had in timing to market have been erased by a combination of development delays and decisions by Boeing and Airbus to upgrade and re-engine the 737 and A320. And those aircraft can be turned out at much higher volume than COMAC will be able to manage. Several of the defining cultural and organizational attributes of a world-class customer support organization such as empowerment of rank-and-file staff, delegation of authority, and globally distributed decision-making are not often seen as strengths at China's state-owned enterprises that are more likely to be viewed as being hierarchical and centralized. Hence, achieving global airline industry confidence in its customer support services will be particularly mission-critical for COMAC. To its credit, COMAC has recognized the importance of building up customer support and has brought on board a number of highly regarded industry executives with extensive experience at first-rate airlines and aerospace manufacturing companies. In short, the C919 is unlikely to be a commercial success. But a recent RAND study suggests China is prepared to wear long-term losses in order to enter this market and build a true peer-competitor to Boeing and Airbus. And it is a long-term game. After all, Airbus started on relatively modest terms too. It's A300 first flew in October 1972 and sold 561 copies in total. It then took Airbus until the early 2000s to reach parity with Boeing in terms of aircraft deliveries. But if anything, China and COMAC are starting from further behind than Airbus, because China is at an earlier stage of overall economic development than its competitors, and it lacks the depth of aviation and engineering expertise that Airbus could draw on from around Western Europe. After interviewing a wide range of people familiar with the Chinese aeronautics industry in 2014, the think tank Rand reported: “Although our interlocutors spoke highly of the manufacturing and engineering skills available in China, they spoke less highly of Chinese project management skills.” The punitive approach to safety often found in China could be a serious concern for buyers, suggests Marc Szepan, an aerospace executive who has studied the Chinese aeronautics and aviation industries and now teaches at the UK’s Oxford University. In many other countries, honest mistakes imperiling aviation safety are generally treated as learning opportunities. But the Chinese industries often enforce rules by punishing wrongdoers. That can discourage people from owning up to mistakes, potentially keeping problems hidden. China's next step into the aviation world is development of a 'widebody'; that is, a long-range passenger jet with twin aisles that can compete with prestige Boeing and Airbus products such as the 777 and A330. Surprisingly, rather than developing the jet in-house at COMAC, China has decided on a joint venture with Russia's United Aircraft Corporation. But a recent piece by Aviation Week's excellent Asia Pacific Bureau Chief Bradley Perrett suggests the project is already in trouble, and that the joint-venture was a political decision made against the wishes of COMAC. All in all, China and COMAC face a lot of challenges if they want to succeed in this market (and I haven't mentioned all of them; James Fallows' China Airborne is a good source on this). But although the experts who are downplaying the commercial significance of the C919 are not wrong, it may be that their frame of reference is too narrow. Much like the aircraft-carrier program I wrote about recently, and the manned space program, China is prepared to invest heavily in sometimes decades-old and certainly second-best technology in order to get a foothold - it is making long-term investments towards eventually developing competitive technologies that are fully indigenous.